Based on 3105 customer ratings. Isn’t it time you stopped by our Orlando dining room to see why we’re famous? Enjoy a glass of wine or beer on our patio, or call us to place an order for pickup or delivery. Orlando is home to Universal Studios, SeaWorld, Disney, Epcot and all the rides and attractions of some of the biggest attraction and theme parks in the world. Once you’ve had enough of the rides and roller coasters, though, there is much to see and explore in Orlando itself. Check out Discovery Cove to see marine wildlife up close and personal. Check out the museums, stores and parks of the region and you’ll find out why millions of visitors want to come here. 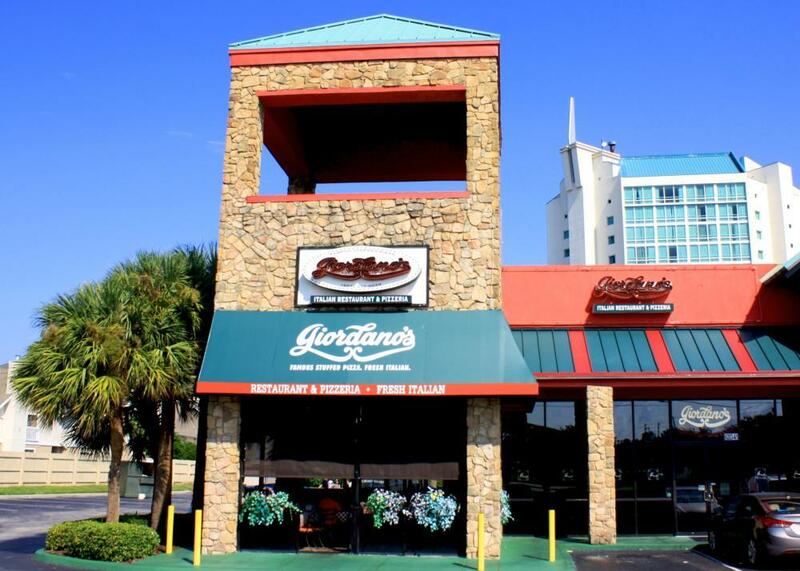 All the walking, exploring and shopping you can do in Orlando is sure to leave you hungry and thirsty – and Giordano’s has the solution. Step into our comfortable dining room and bite into our delicious Chicago-style pizzas. Prepared by artisans and based on an authentic Italian recipe, this is the pizza that made Chicago famous. With a perfect balance of the freshest ingredients and plenty of other menu items to try, you’ll leave feeling full and ready to tackle all the attractions Orlando has to offer. You can also call us for delivery or takeout. Relax with your pizza at home, in your hotel or in the Florida sun. Giordano’s mouthwatering and authentic Chicago pizza works perfectly everywhere – just get used to the jealous looks from other tourists ogling your delicious meal. When it comes to Orlando, there is nothing like Universal Studios. When it comes to pizza, there is nothing like Giordano’s! Giordano’s is home to the best deep dish pizza in Chicago, and now you can enjoy every delicious bite of our famous double-crust pies right here in Orlando. You’ll love how eating at Giordano’s is an experience instead of just another Italian restaurant. Are you ready to experience the best pizza place in Orlando? The flakiest crust baked to perfection. The fluffiest mozzarella, made exclusively for us on a small Wisconsin farm. The freshest vegetables and the most flavorful meats. It’s these ingredients our trained artisans use to construct the most delicious stuffed pies in the world — pies that have sealed our reputation as the best pizza delivery and restaurant in Chicago. Now you can enjoy our famous pizza after visiting your favorite Orlando attractions! Giordano’s has something for everyone to love. You’ll find our pastas, sandwiches, salads and appetizers are made with our proud family heritage in mind. We even have mouthwatering gluten-free options, too! Want to enjoy the flavors of real Chicago deep-dish pizza, without having to worry about snow and ice? At our sunny Orlando location, you get the best of both worlds. Stop by Giordano’s at our Universal Studio location to experience it for yourself, or contact us for delivery or takeout. Either way, you get the best Chicago-style pizza in Chicago, Orlando or anywhere else.